How I get Fit? Any Way I Can! Yoga is something that is very much connected to your mindset. There’s a man in my current classes who is constantly looking at everyone else, grunting through the tougher poses and packing up before shavasana (rest) is over at the end. Sadly, although he seems to be in better shape than I am and others in class, he’ll never get where he wants to go. He’s missed the point of yoga – it’s about letting go, gently moving where your body allows and not letting ego be in the way. This is something I too am learning to overcome while I begin a fresh fitness journey. Battling an international move can be beyond exhausting. The last couple months have caused me to throw every other priority out the window. My yoga practice has suffered, I’ve been stress eating and drinking way too much alcohol than I should. I’ve made it back to Massachusetts and am close to settling back in a routine, but everything is eschewed and in dire need to a re-vamp. Luckily, now that things like phones, a car and a place to live are settled, I can re-evaluate my personal self, body and mind to align them with a clam and grounding too. Here’s what I’ve started in partnership with Decathlon UK and plan to do in the coming months to truly get going on meeting my goals! Confession: I know I have to get on the scale. I really rather do anything else on the planet than that! So it might not be the best advice, but I’m going to avoid that for now. I am though going to set goals of remaining in a calorie deficit every day if possible (tracked through my Fitbit and the MyFitness Pal app). I’ll also do 3-4 days of cardio a week (at least one hour) and 3-4 hour-long sessions of yoga. The goal is to feel better in my space and with myself. It’s to take care of the one body I’ve been given and ensure I’m able to feel as good as I can. I’d like to take up some running in the near future and complete a 5k by the summer. I’d also like to deepen my asanas (postures) in yoga without feeling fatigues or distracted by discomfort that can come on due to being unfit. Here’s the basic weekly routine that I am finding manageable. People who want to have a good, solid workout while not feeling extremely sore and tired all the time can follow a similar regime. When you’ve finally hit your stride, or decided to get going on day one, you know that’s a special feeling. The best part is, you don’t need anything super special to accomplish this new outlook. Cork is the best because it’s nice and sticky, but foam and rubber also fit the bill. I like a little thickness for my knees and wrists as well. This can help stretch out before and after a yoga sesh. A strap also helps with holds if you can’t quite reach your feet. You can get this one at Decathlon for only a couple pounds. When I’m feeling less bendy on some days, a cork block is a lifesaver. Again we don’t want to overextend or be in pain, so a cork block can help with lunges and elevating wrist pain too in downward dog. I like a good restorative session after a vigorous vinasya class at a studio or at home. A bolster is basically a giant firm pillow that is life-changing for back support and more. I have a whole drawer of leggings – but by far my favorite are the Domyos Women’s Seamless 7/8 Yoga Leggings. I don’t mind investing in good leggings, but these are a 1/8th of the cost of some other high-end athleticwear stores. 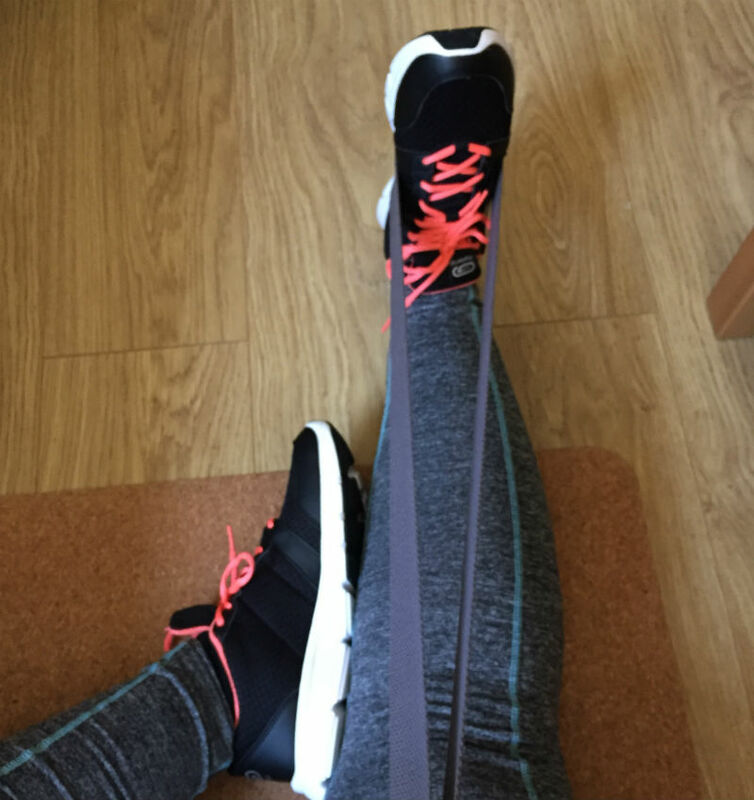 They are beautifully comfortable, extra stretchy and never slip while I do my yoga practice. This is like finding a unicorn for big girls who work out. I got them in both colors and hope they do a basic black in this style soon. What do you do to stay fit mentally and physically? What’s your routine? What’s your go-to way to get centered and get sweaty? Good for you Eileen! I am a deep yin yoga guy for the past 8 months. 40-45 minutes on waking. I recently began doing 12-15 at night. How the practice opened up my body, I cannot stress. Like surgery LOL. It’s helped me with my running, jogging and posture spent working long days online, blogging from paradise. I also noted more eBook sales and blogging revenue because when you open up physically, you open up energetically, removing blocks to success.